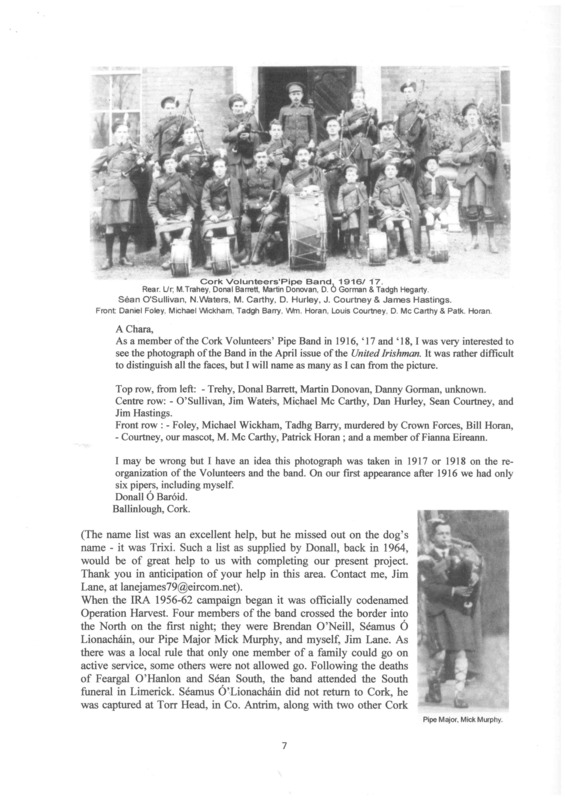 Seamus Linehan, another member of the band during the 50's, writes about it in his e-book, "A Rebel Spirit" (https://www.facebook.com/profile.php?id=140265629383498) "My brother Mick was a member of The Cork Volunteers Pipe Band, he was a piper and he had been playing the pipes for a number of years. A school friend of mine was also a member and he encouraged me to join the band. Eventually when I did join, I decided to learn how to play the pipes and within six months I was playing out with the band. From then on I really enjoyed my association with the band, we traveled the length and breath of County Cork playing at feiseanna, matches, meetings, dances and funerals, and we often played further afield in Kerry, Limerick, Clare and Waterford. 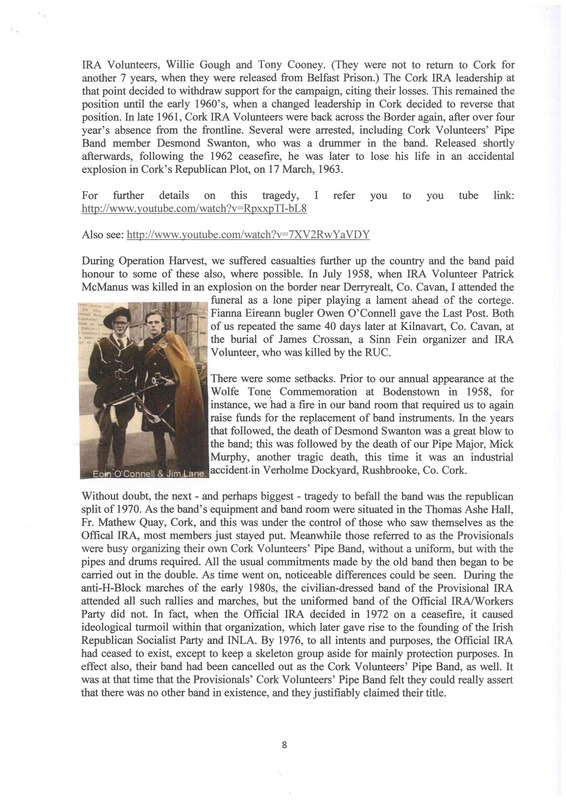 The band was well known as being a unit of the IRA and was founded by the late murdered Lord Mayor Tomas Mac Curtain, in 1913, and was always available to attend at Republican functions throughout the country and even outside the country too in places like Dublin. We had some great times and made some great friends at all the different locations and we spent many happy days and nights in Ballinhassig, Ballinaspittle, Bandon, Carrigtwohill, Cobh, and we have special names to tie into these places. 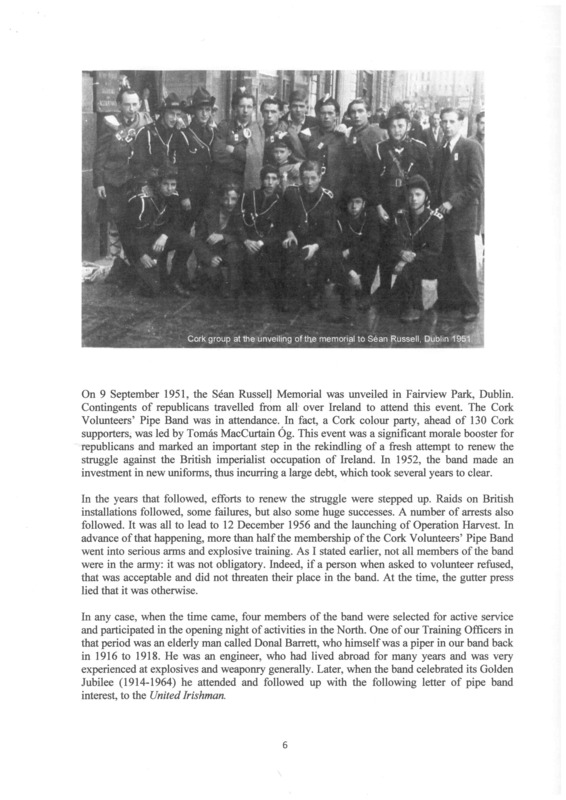 In early 1952 the Republican Movement began to reorganize throughout the length and breath of Ireland and in Munster the band were involved in playing at all public meetings organized in Cork, Kerry, Limerick, Clare, Tipperary and Waterford. It was very inspiring to listen to the speeches at these meetings..... In late 1953 the band decided to organize a draw to raise funds and it was a big undertaking. The three main prizes were two weeks holidays in various locations around Ireland and there were many other prizes as well. As well as selling books of tickets we also put very colorful draw cards into various shops and pubs around the city and we also distributed them to fellow republican branches around the country "